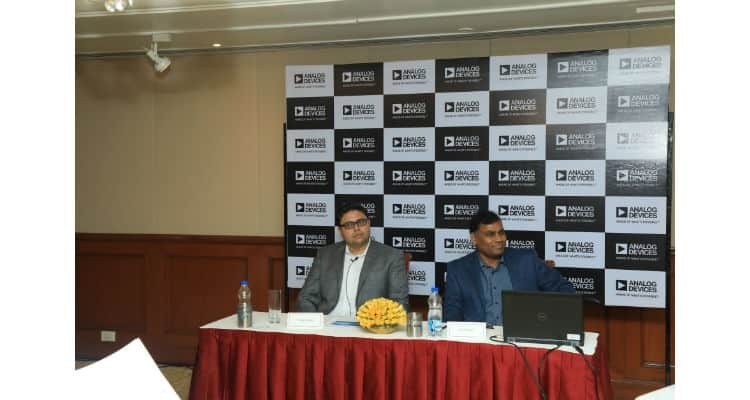 Analog Devices has unveiled its new India headquarters for the approximately 600 Bengaluru-based staff who make up ADI India. The new facility, which houses one of ADI’s top three global design centres, will focus on developing and selling cutting edge technologies and solutions for the global automotive, industrial, healthcare, consumer, Internet of Things (IoT), security, communications, and energy markets. Having started as a three-person product development centre in 1995, ADI India’s headcount has grown by a factor of 200 over the last twenty years to support the evolving needs of ADI’s global customers. Mirroring ADI’s transformation from a manufacturer of modules and integrated circuits (ICs) to a provider of edge-to-cloud systems, and from a focus solely on hardware to one that includes software and data analytics, ADI India counts software, artificial intelligence (AI), machine learning (ML), applications, product and test engineering, systems, and analog and mixed signal IC development among its broad suite of capabilities. Today, ADI India is a global development centre for ADI, working collaboratively across all ADI businesses on all stages of product development – from concept to silicon to production to application – as well as providing the supporting software. ADI India’s product portfolio includes digital signal processors (DSP), complex system on chip (SoC), analog to digital (ADC) and digital to analog (DAC) precision converters, video processing, ultra-low power microcontrollers, high speed converters, advanced driver assistance systems (ADAS), micro-electro-mechanical systems (MEMS), software tools and algorithms. ADI India has developed some of the Company’s most successful products. ADI’s high-performance, power-efficient ADSP-21584 processor – designed, developed and supported by ADI India – is used by one of the world’s leading consumer audio brands in a premium sound bar that has won accolades at the International Consumer Electronics Show (CES) and enabled our customer to increase its market share in the competitive sound bar market. The ADI India-developed DSP, ADSP-21479, is being used by a U.S.-based medical electronics company in its pulse oximeter to enable unparalleled levels of performance in challenging conditions where traditional pulse oximeters fail. Located on Old Madras Road, the new facility is conveniently located close to Byappanahalli Metro Station. The new 175,000 square foot facility features height adjustable work stations, centrally located state-of-the-art testing labs, well-furnished common spaces for collaboration, work cafes on each of the six floors with gourmet beverage machines, a yoga studio, a spacious central cafeteria with multiple food options and big screen TVs, and energy-efficient electrical and HVAC systems. The facility has a capacity for up to 920 employees, allowing for a 50 percent increase in ADI India’s current headcount. ADI India currently hires new graduates from IITs, NITs and other reputed engineering institutions, and has plans to hire software, systems engineering, and IC design and development engineers both at the experienced and entry levels. It runs a robust internship program where students are given the opportunity to gain hands-on experience in the industry. ADI India has also played an instrumental role in setting up partnerships with globally renowned Indian design services companies and research institutes, which has contributed to injecting additional innovation, agility, and workforce flexibility to ADI’s product development, while helping to establish mutually beneficial relationships with our partners and customers in the region. ANALOG DEVICES OPENS NEW BENGALURU FACILITY 0 out of 5 based on 0 ratings. 0 user reviews.